Moving on from the cover, to the actual story it depicts - which is of course Blood of Satanus II - Dark Matters. I had a good close look at the art this time, and decided it's not for me. Black and white pens I do like, but Mighten leaves too much white space in the background for my liking. Sorry Duke! The first panel was fun, because the mark of the 'chosen ones' is that their second toe is longer than their big toe. My wife has this on her feet, so I'm slightly worried right now... :-) Mills' story is good, and I'm enjoying it, and Duke's art doesn't distract from it - which is good news. The later panels are full of detail of the T-Rex fighting Dredd. 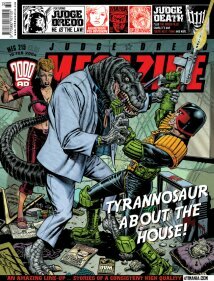 The stand-alone Dredd story My Beautiful Career was a really good story. It featured a meeting of Employees Anonymous being interrupted by a gun man with a special reason to hate the employed. I love these Dredd stories where we get an insight into the workings of Mega City One. Art droid Simon Coleby was on good form, and I feel I should give a shout out to Chris Blythe's colouring and the legend that is Tom Frame (RIP) and his lettering. Not noticing these things in reading the Meg is the highest form of praise because they simply work well as part of the overall package. Big shout out to colourers and letterers! Judge Death Wilderness Days dipped again for me. This strip is a real roller coaster. Don't get me wrong, I don't hate reading the episodes that aren't as good, but I can't help but think that less episodes and a higher pace would have served this story better. Frazer Irving's art is still on top form - positively mind-bending in places (or a better description might be psychedelic - if you can have psychedelic in black and white!). I can't praise the Judge Anderson Half Life story enough - its absolutely gripping. I'm on the edge of my seat wondering what will happen with Anderson and how she is going to defeat Death this time. I won't say much about the storyline, as it's too big a spoiler I think, but suffice to say Alan Grant and Tony Luke have pulled off an interesting twist to the Anderson / Death battle. Ranson's art is delicious too! This is one of those stories where you really look forward to pulling open the next Meg and deciding whether to read it first or save it to last! I don't know how the events led up to this point, because they are chronicled in Progs and/or Case Files I haven't read, but that doesn't spoil the story at all. In the latest Whatever Happenned To series we turn the spotlight on Maria - Dredd's long serving land lady whose a bit handy with a cooking laser when she needs to be. Again, I won't say much about the story because it's a bit too big a spoiler, but it was fun reliving some of Maria's most glorious moments. I don't think Gordon Rennie thinks much of Maria, though, as he kind-of spoilt her character a bit for me. I'm not one of these people who thought Walter the Wobot and Maria ruined Dredd or were bad for the strip - they were characters for a different era and I look upon them rather fondly. So for Gordon to strip away some of the things about Maria and make her out to be a bit of a fraud in some areas, I didn't like much. Manley is on art duties and does well. Text articles where The Dredd Files which detailed more fact and figures about early Dredd stories. I completely skipped it and will continue to do so. Gordon Rennie charted the history of the gay comic book character in You're Next, Punk. I'm sure a few characters might be a little surprised at how Gordon perceives them! And there was news that Dredd was hitting the pages of the Metro newspaper for a six month run. I wasn't commuting into London at the time, and actually even if I was I don't read the paper, so I wonder whether it was any good...? And finally...Floyd Kermode got another letter published in Dreddlines. Is he a mate of Alan Barnes, or did Dreddlines only get about 5 letters a month? Drop us a comment or tweet if you are reading, Floyd! I know Dreddlines isn't printed often in the latest Megs because they don't get many letters - so drop them a note (dreddlines@2000adonline.com) if you like this blog, or if you have anything to say about the Meg. Or even if you don't like the Meg - they love a bit of negativity in those letters pages!